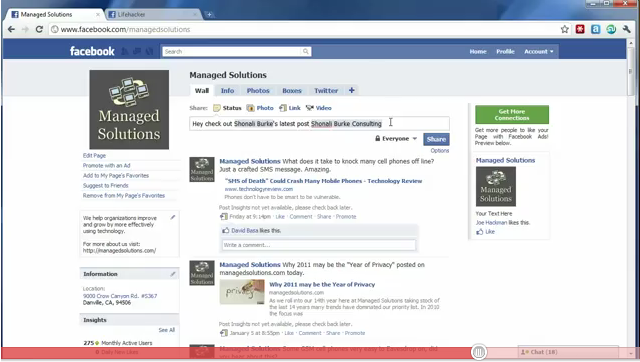 I recorded this video to show people how to use the relatively simple tagging function on Facebook. I also explain more in depth in the video some of the etiquette involved with tagging people and pages. This is a great introduction to the feature if you are unsure how to use it or are looking for a starting point on etiquette. Do you have any Facebook related topics that you’d like to see a video of? Please let me know and I will try to include it in this series. Most Email fits in this category, most people don’t flag messages at all or use the subject line of the Email to indicate the nature of the message. This option is sometimes over utilized, I’ve seen some Email users that seem to flag a large percentage of their messages as high importance. This is acceptable if it is factual. I recommend using this option for messages where the response required is timely or the information will be considered urgent by the recipient. In conjunction with some carefully crafted subjects you can provide a range of urgency to the recipient. Check out more Quick Tips.